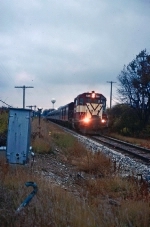 Description: The eastbound local crosses the ex-SOO/MILW Fox River bridge in downtown. Description: The eastbound local scoots to Shops Yard. Description: A fall colors passenger extra sponsored by the Great Lakes Central with North Shore Scenic equipment heads west to Elkhart Lake. 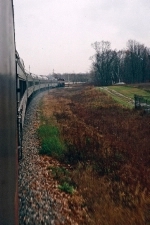 Description: A fall colors passenger extra sponsored by the Great Lakes Central with North Shore Scenic equipment slows to a stop. 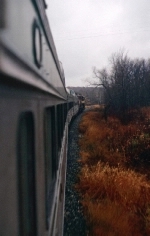 Description: A fall colors passenger extra sponsored by the Great Lakes Central with North Shore Scenic equipment pauses for a passenger stop. 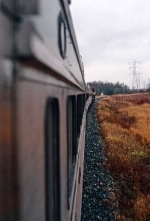 The 589 was on the west end of the train. Description: A fall colors passenger extra sponsored by the Great Lakes Central with North Shore Scenic equipment heads east to Cedarburg. The 589 was on the west end of the train. Description: A fall colors passenger extra sponsored by the Great Lakes Central with North Shore Scenic equipment heads east to Cedarburg. 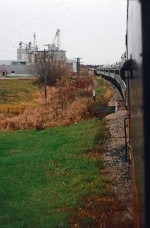 The train passes between the ex-MILW (right) and ex-CNW (left) depots. 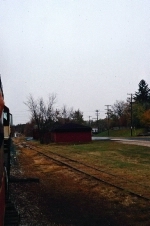 The out of service CNW trackage is on the left. The 589 was on the west end of the train. Description: A fall colors passenger extra sponsored by the Great Lakes Central with North Shore Scenic equipment has arrived at the west end of the trip. Having pulled down the siding the 589 is united with the 4005 to be added to the east end of the train. 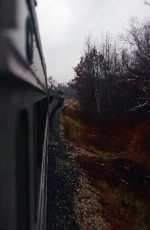 Description: A fall colors passenger extra sponsored by the Great Lakes Central with North Shore Scenic equipment prepares to head east to Cedarburg. 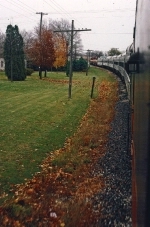 Description: A fall colors passenger extra sponsored by the Great Lakes Central with North Shore Scenic equipment heads east to Cedarburg. Description: A fall colors passenger extra sponsored by the Great Lakes Central with North Shore Scenic equipment heads east to Cedarburg. The head end is crossing where the diamond with the CNW was. 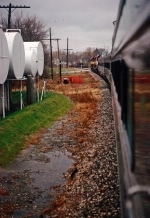 The out of service CNW trackage is on the right. 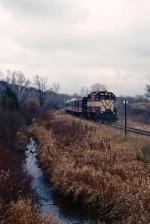 Description: A fall colors passenger extra sponsored by the Great Lakes Central with North Shore Scenic equipment rolls to a stop. 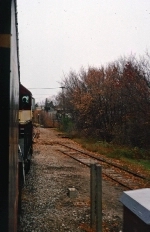 Description: A fall colors passenger extra sponsored by the Great Lakes Central with North Shore Scenic equipment sits in the siding at Cedarburg before loading passengers. 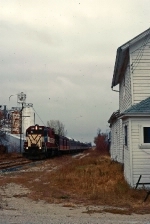 Description: A fall colors passenger extra sponsored by the Great Lakes Central with North Shore Scenic equipment heads west passing the ex-CNW depot and the out of service ex-CNW trackage on the right. 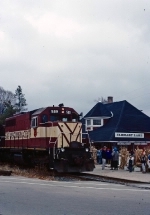 Description: A fall colors passenger extra sponsored by the Great Lakes Central with North Shore Scenic equipment heads west about to cross where the diamond with the CNW was. Description: A fall colors passenger extra sponsored by the Great Lakes Central with North Shore Scenic equipment has arrived at the west end of the trip. 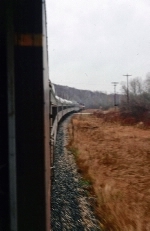 The 589 heads east down the siding to be put on the east end with the 4005.. 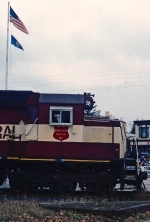 Description: WC 589, WC/GBW 116 on a transfer to Canada. 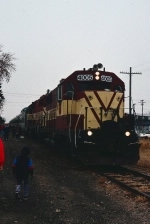 Title: L039 and L040 meeting at Brampton MI. Date unknown.